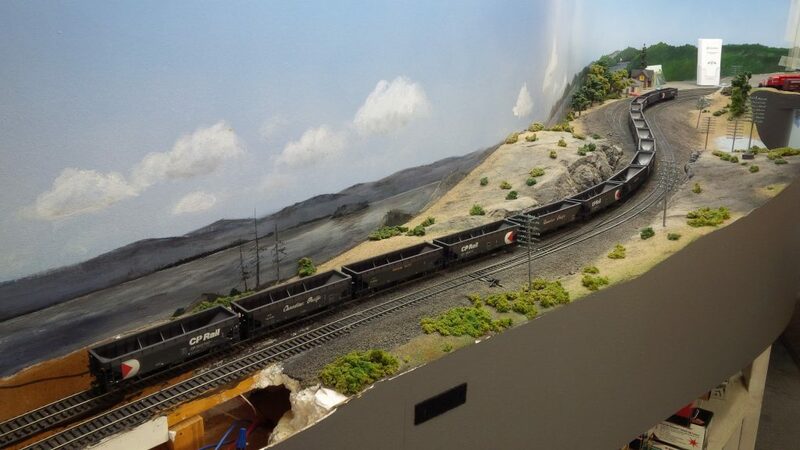 An event of some significance for our club layout occurred recently when a trio of Atlas ballast hoppers were grimed-up and weathered over the course of a regular Wednesday work night. While that may not seem particularly significant, after all I paint and weather equipment at the club’s spraybooth all the time, it did signal a big change in the ever-evolving rolling stock fleet of the CP Sudbury Division. These were the final models of a new fleet of slag hoppers to roll out of our shops, and they will replace our old MDC cars that had been in service with the club for over 20 years. The complete fleet of 16 recently added Atlas ballast hoppers, all weathered and ready to begin hauling slag over the CP Sudbury Division. 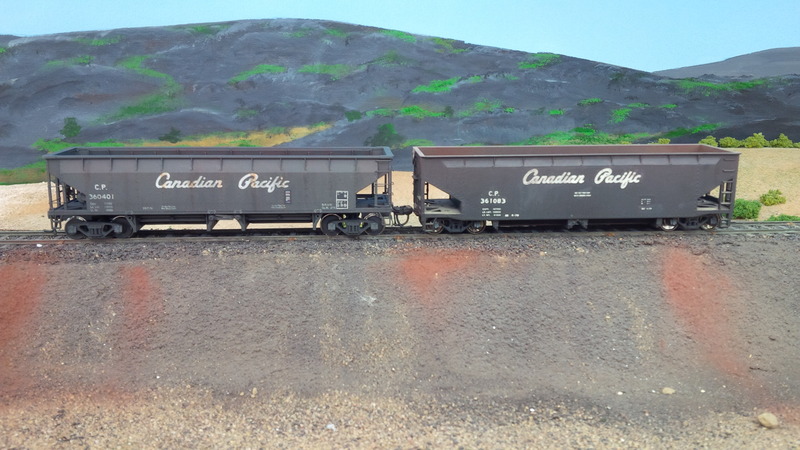 Another view of the fleet of new ballast cars entering service on the Sudbury Division. The MDC-Roundhouse hoppers are crude by today’s standards – the molds were produced in the 1970s and it shows. Not just the thickly molded grab irons and lack of interior details, the worst part of the model was how low the hopper body sat and how shallow that made the unloading bays below. They are almost undetectable. (If someone knows of a prototype car that MDC patterned this after, please post photos/info here in the comments section.) However this was the only longitudinal-bay hopper model available when our club began modelling the CP Sudbury Division, so we assembled a small fleet of MDC models due to lack of alternatives. Side by side comparison of the Atlas model (left) with the old MDC car (right). Coupled together, it is easy to see why the old Roundhouse models are being retired. 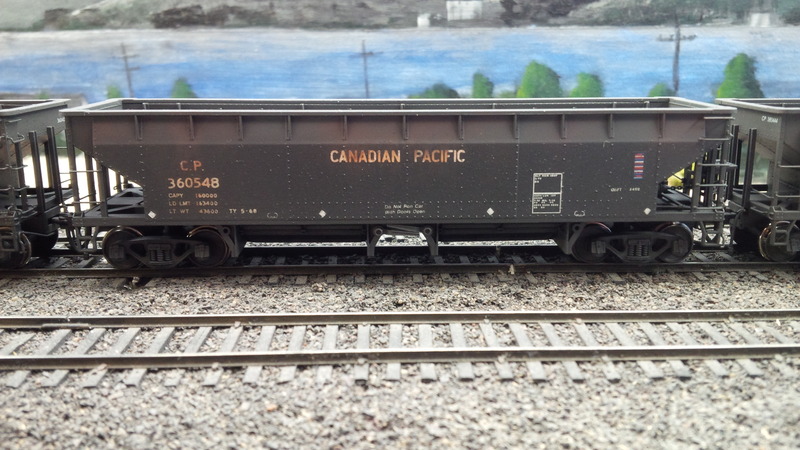 The longitudinal bay ballast hopper is an important car for the ‘70s CP Sudbury Division, all thanks to INCO and the CPR’s maintenance-of-way needs. The byproduct of copper/nickel refining (actually all forms of ore smelting and refining) is called slag; it’s the resulting rock waste you get once all useful minerals have been striped away. INCO has mountains of ugly slag piles growing all around the Sudbury area. And our two big transcon railways, both running through the Sudbury Basin and always on the lookout for cheap solutions to their maintenance needs, began using this crushed slag to ballast their right-of-ways. Take a look at any CP or CN photographs from the ‘60s to the ‘90s. If the tracks are ballasted with a very dark brownish-black rock, that’s Sudbury slag. Slag ballast is the reason why these longitudinal-bay hoppers are so important to our layout operations. Strings of these cars were everywhere in the Sudbury area, all to supply ballast system-wide for CP Rail. So what happened to slag ballast? Well there were two problems with using slag; one that was immediately known, and the other that the Ministry of Environment figured out decades later. Slag being refined rock was very brittle, and breaks apart relatively easily. This meant CP and CN had to continually re-ballast as the slag was pulverized into mud over time under the weight of heavy freight trains. That was not a big deal as slag, being a waste product, was pretty inexpensive. CP 360548 was lettered with a combination of C-D-S dry transfers along with Microscale and Highball decals from various sets I had lying around. Outside weathering is a combination of oil paints, weathering powders and some airbrushing – mainly just a quick coat of “grunge” to dirty up the bottom of the car. The other problem is much more serious. It seems the bedrock of the Sudbury basin contains a trace of naturally occurring mercury. That is not a big deal, provided the rock is undisturbed. Slag, however, is rock that has been disturbed quite a lot. Testing showed mercury was leaching into local water tables from the slag ballast, and so it began to be phased out over time. The situation was worst in the Prairies, where slag ballast was first banned back in the ‘80s. Southern Ontario, with its deeper water tables and lots of limestone, was a safer environment and continued to see slag used until the mid ‘90s. Our new slag hopper fleet is made up of Atlas’ wonderful model of the ACF-built Hart Ballast Car. These were released about 10 years ago, but our delay in making the switch was due to the Atlas model not being a prefect match for the prototype CP slag hoppers. The actual hoppers, numbered within the CP 360000 to 361277 series, were all built between 1949-53. Though three different manufacturers built them (Eastern Car mostly for the CPR, though Canadian Car & Foundry and NSC produced them too) the visual differences between them are slight. Weathering the inside of a ballast car is a very different process than for coal hoppers. Coal is acidic, and the hoppers that carry it become a rusty mess inside. Ballast does not corrode the interior, rather it bangs and scrapes the hopper bottoms to polished metal. To capture the look I first airbrushed the interiors with Model Master flat aluminum, then oversprayed the top with grunge (a combination of black, browns and greens to simulate dirt). I finish with Pan Pastels to simulate the rust and dirt that does take hold, and seal all the weathering work with Tamiya flat coat. There are two visual differences between the real thing and the Atlas model, the first being the top end panels of the hoppers having a notch in them (where the end ladders meet up). The prototype cars feature straight beveled end panels. 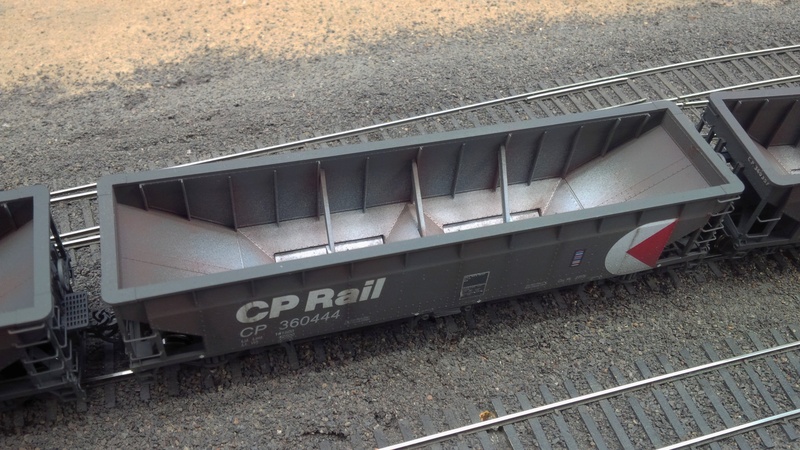 The other difference is seen in the hopper bays, which are longer and of a different design than the actual CP hoppers. 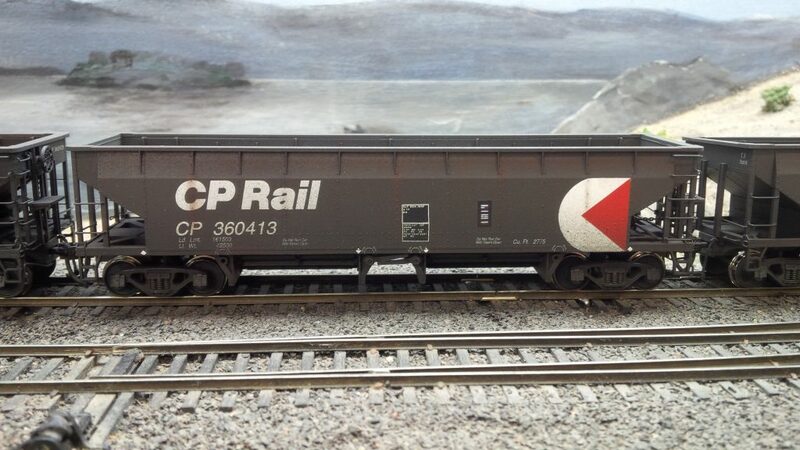 CP 360413 is lightly weathered, as the CP Rail paint scheme was only a few years old in our club’s modelling era, so it would be a recently repainted car. Weathering was done with Pan Pastels and some airbrushed “grunge” along the bottom of the car. Despite our hope that maybe, one day, a perfect Canadian ballast car might appear on the market, we decided that the old MDC-Roundhouse cars really needed an upgrade. 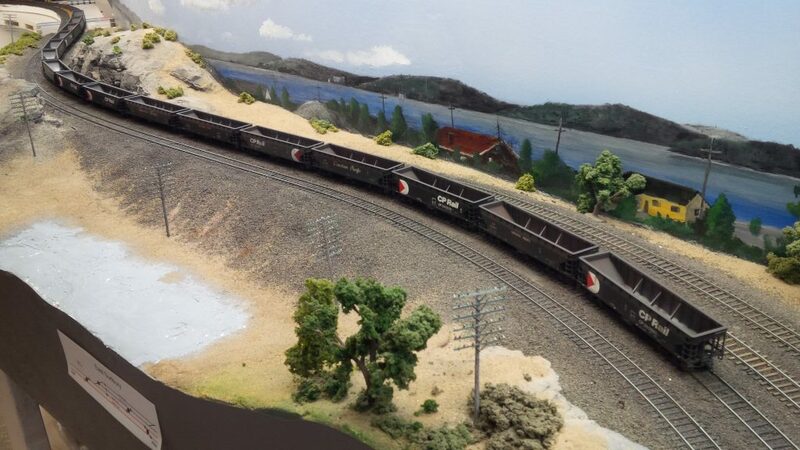 The influx of amazing new, super-detailed models that have been populating the Sudbury Division layout were really making the old ballast cars look out of place. And the Atlas model is well done, not only from its crisply detailed molding, wire grabirons, nice brake and end details; but this model also featured a fully-detailed interior complete with L-brackets and rivet-detail. The hopper bay doors actually open too, though since we operate these models with live loads we highly recommend our operators DO NOT open them when transporting slag. Though not 100% perfect, these Atlas models are a very good stand in and they will begin hauling slag on the Sudbury Division starting with our first operating session of the 2016-17 season this September 10th. Dean Purcell on Got Slag?